Seems this thread has grown a bit since my first post. Anyway, after the latest hotfix it seems like the AP is tracking the FMS course better than it did initially. I have not had any problems as of yet with the newest fix when it comes to departures, cruise and arrival. And it is being looked at of course. I can tell you the reason for the deviation on long directs. Actually, the aircraft flies precisely on the right course. It's the line that's not correct. 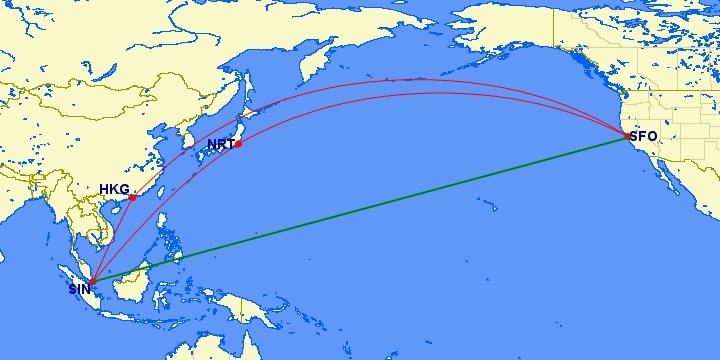 If you look at this picture, you see the two red lines which describe a great circle route from SIN to SFO (forget the midpoints in HKG/NRT). 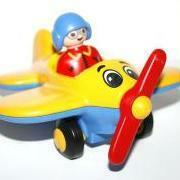 That is what the aircraft is supposed to fly and that's what it does fly. The green line depicts what is shown in the MFD. What's needed to show the correct line would be either a curve instead of a line (I had that in one beta version but it caused a lot of head-shaking by the pilots among the testers) or a map projection (for example Mercator projection). I'm currently trying to find out which projection is used on the real thing. If any of the real world CRJ guys among you know that, please shoot me a PM. I'll be forever grateful. I think the problem is deeper than just the drawing of the line on MFD which was messed up on this approach.. Some issue with FMS or autopilot. 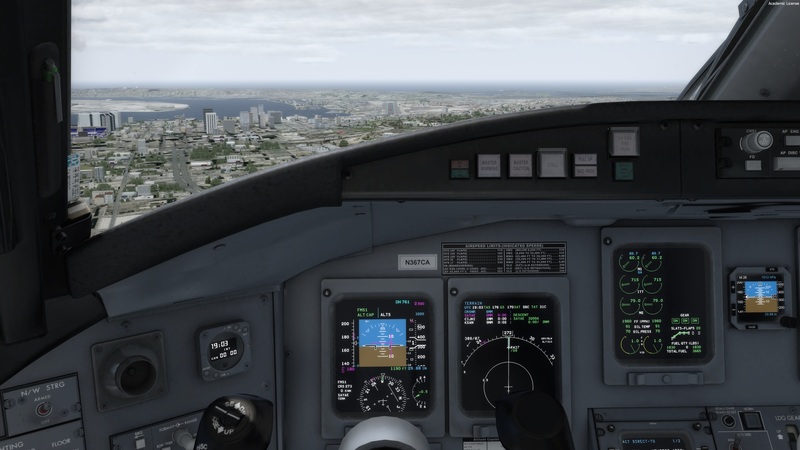 Can someone else try the RNAV Z into 27 at KSAN? FMS mode didn't track correctly and missed a waypoint and started tracking toward he last waypoint.. I had to take over manually which I didn't mind but here's a pic to show what I'm referring to. 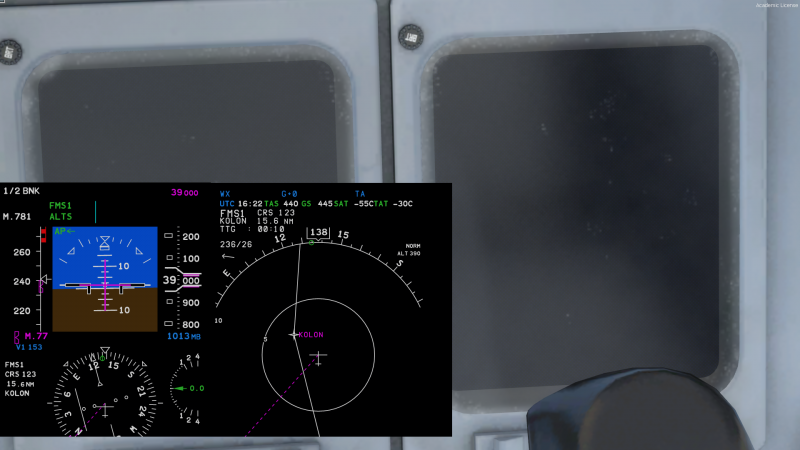 I was doing 180kts which was the normal speed for that area in the turn to final. This happend to me today! The aircraft did not only fly not on the line but also beside the waypoint. Another funny thing... Note the opposition between FD the Yoke and the Indication on the PFD. This stayed so until the next waypoint. As I disconnected the AP and set it upright I was flying like before... no movements to the left or right. I think the problem is deeper than just the drawing of the line on MFD which was messed up on this approach.. Some issue with FMS or autopilot. Tell me please, in which way does an approach have anything to do with a long direct? This thread is about apples and your talking about oranges. What am I supposed to see there? What you should see is a centered course needle and the aircraft on the line just like every other airliner in the world. The aircraft is not on the line nor is the cours needle centered. I know, that needs to be fixed. Sorry, but the straight line theory doesn't cut it, really. Notice in this picture the directly extracted pos from PFPX along the curved line (65N010W - 65N000E), and the scale bar on the bottom. Then notice the position and route on the ND, and then that the CDI thinks the correct path is far off-scale further north, when the proper track is actually a few hundred meters south. 0.3nm left? how long was this leg? Sorry? The CDI shows me far off course in the wrong direction. Both the true and the magnetic track lies to the south, while the NAV system suggest I go far further north. This is not the same as fr24 and real flights, no. The CDI does not show the real direct line over a curved earth, it's just completely bonkers. I mentioned the exact same issue on the exact same approach on the previous page. Haven't had a chance to test it after the new hotfix though. The CDI error is not only in the Nav mode with the FMS but also if you tracking the Localizer. Different ILS approaches are right of the center line. Control wheel is sometimes fixed in a right roll position and did not follow the AP. If there is a waypoint change the Control wheel comes alive for a moment. There is a lot to do within the AP lateral steering signal computation. also due to the audio nav ident error. I found out why the audio nav ident stuff comes up, it's either a misclick or command cross-over happening when you hit ctrl+shift+1 and 2 for the CDU keyboard input. 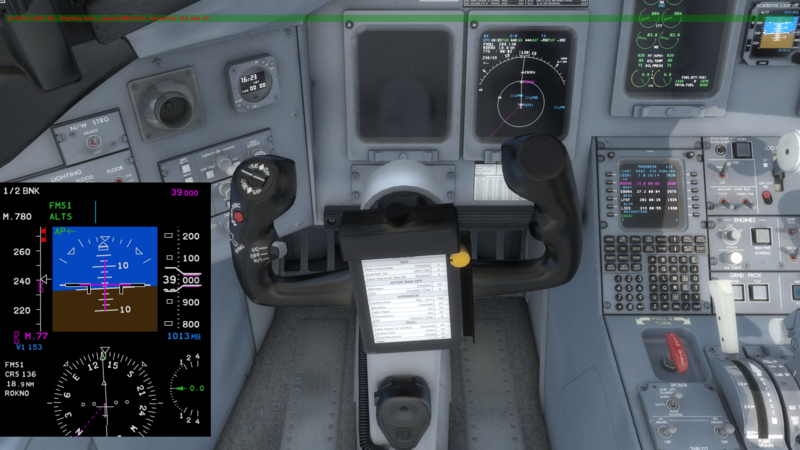 Default sim binds for nav audio is ctrl+1 and 2 (or shift, can't remember precisely). I seriously doubt that. The only way that could happen is if NAV IDENT would be assigned to any of these shortcuts in P3D itself. In my P3Ds (v4 Pro Plus and v3.4 Pro) it's "Enable Countermeasure System" on ctrl+shift+1 and "Arm Countermeasure System" on ctrl+shift+2. So that simply can not be related. The reason was that I didn't mute the Nav Idents on loading. But that doesn't change anything about the fact that the root cause is that they were activated in the scenario file loaded or in the previous aircraft. I consider correcting that to be a service, not a bug fix. there is simply a problem with the CRJ. And with what file status those screenshots were made? And what was the current flightplan? Posts like yours might make a lot of sense to you but they do not show anything that we can use to solve issues. currently on direct from KP66C to MZV, both the EFB and the map screen are showing me 5mi south of the direct line. i even just went direct from my current position to MZV and it is slowly veering off to the right of course. Really excited to hear this, this is the only issue really getting in the way of my full enjoyment of this aircraft. Thanks for the update!